Beadalon wire .010" is the smallest wire, use it for lightweight bead stringing or weaving of seed beads, freshwater pearls and very small gemstone beads. It is nylon coated for increased kink resistance, longevity, and abrasion resistance. 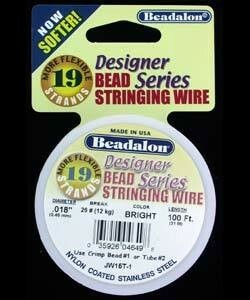 Beadalon 19 is also available in more sizes than Beadalon 49. The limp, extra supple qualities of Beadalon 19 make it well suited for creating superior quality anklets, bracelets, necklaces, watchbands, and other designs.